Why was Model 90 Introduced? Type 0 and DBA-ESDI Success! Badge- Grey, XGA. Blue, XGA-2 Adapter originally installed (Blue = ISO compliant). 5.25" Bay Outer rails are for a 5.25" drive. The left and center rails are for a 3.5" drive. * - 3.5” Device Filler Bezel takes up extra room to the right for shorter device bezels.
? - Not sure at present. The bezels for the B: bay [5.25"] are NOT compatible with those for the C: and D: bays. The bezels for the B: bay [85F0006 / 85F0005] use a sorta "cage", where the bezel has depth, plus the lower hooks actually extend into the frame and hook into slots. The C: and D: bay bezels [85F0034] are flat and they slide over the sheet metal lip at the front lower frame edge. U13 14.3181 MHz "System Oscillator". U77 22.1184 MHz Clock for "Type 3 High-Speed UART". Divided by 2 for better waveform and 1:1 ratio of low and high. Two access holes through the Model 90 Base Frame to allow for the removal of the Base Fan 64F4128 WITHOUT having to remove the Adapter Card-Guide Assembly 33F8363. Base fan uses AWM Style 1007, 24 AWG wire. Loosen both thumbscrews on back panel. Remove cover by sliding it forward approximately 50 mm (2 in. ), and then lifting it. Reverse procedure to replace cover. 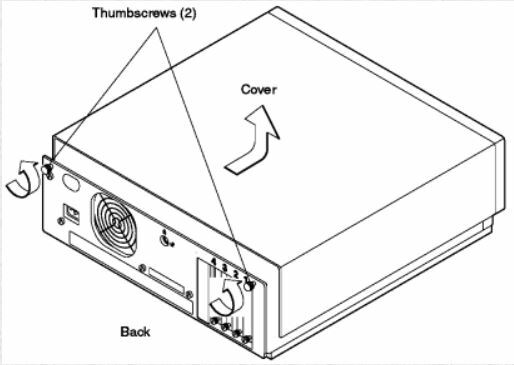 Loosen both thumbscrews on back panel. Do NOT remove them, they are captive. Remove cover by slapping it on the sides with the palms and fingers of both hands, thumbs on the top of the case. Slide it forward @ 2 in., and then lifting it. Sometimes it takes more moxie to start the cover. Reverse procedure to replace cover by SIMMply placing the horizontal pins into the rails, then slowly push the top cover rearward until it seats..
Why was the 90 introduced? The Model 90 was intended to be a "desktop server". It came out in 1989/90. A few years before the Bermuda 77 and Lacuna 77. The 77 was the replacement for the Mod. 90, but it continued in the 95xx Premium Line until about 1994. The main reason for releasing the Mod. 90 was most likely to replace the Mod. 70 and to have a desktop cousin to the Mod. 95. DBA-ESDI Boot Support with the Type 0: Daniel Hamilton dug down into the Type-0 abyss and found out while yes you can boot from the DBA-ESDI drive, you must still have a SCSI drive on a Spock to provide IML. 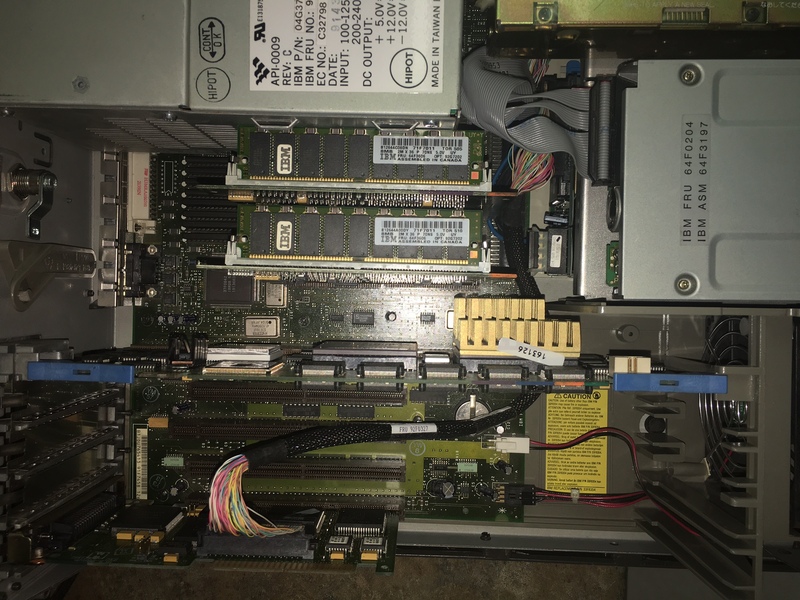 Read his further bone-chilling adventures in the DBA-ESDI Temple of Doom HERE Being able to boot from a DBA-ESDI drive as C: offers a simple upgrade path for the Model 70 to Model 90, just by swapping the drive out. One advantage the model 90 has over the 77 is the 8 SIMM slots. Eight 8MB SIMMs are allot cheaper than four 16MB sticks right now. We also have the caching SCSI that could have its cache upgraded. You don't have to pull adapter cards to reconfigure RAM. I prefer the planar mounted bus connectors too. Complex Seating - The Model 90 orients the complex vertically, so you can press down on the center top edge of a complex to seat it. The 95 forces you to drop it down on it's side if you want to firmly seat the complex, or try to hold the complex with one hand, center the complex in the double long socket, and press it in while bracing the system with your other hand. NOTE: From sad personal experience, on a 95 standing up, the complex can hang down below the complex double slot if you don't pull the blue levers stick straight up from the planar before trying to seat the complex. 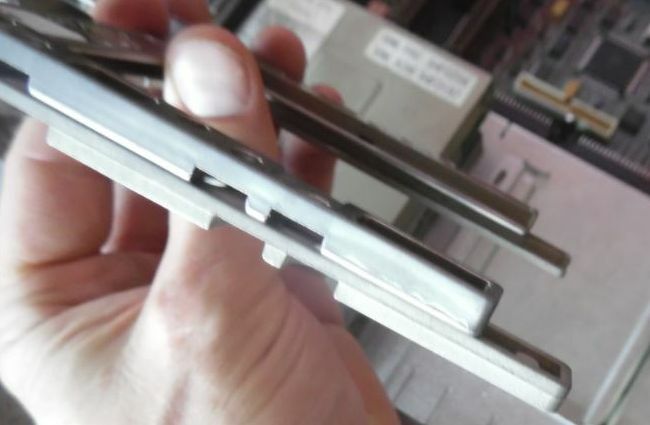 Then carefully place the complex edge connector in the complex slot. Push the complex in until it seats and the fingers on the blue latches are lined up with the case supports. You may have to push one end of the complex in and then the other. 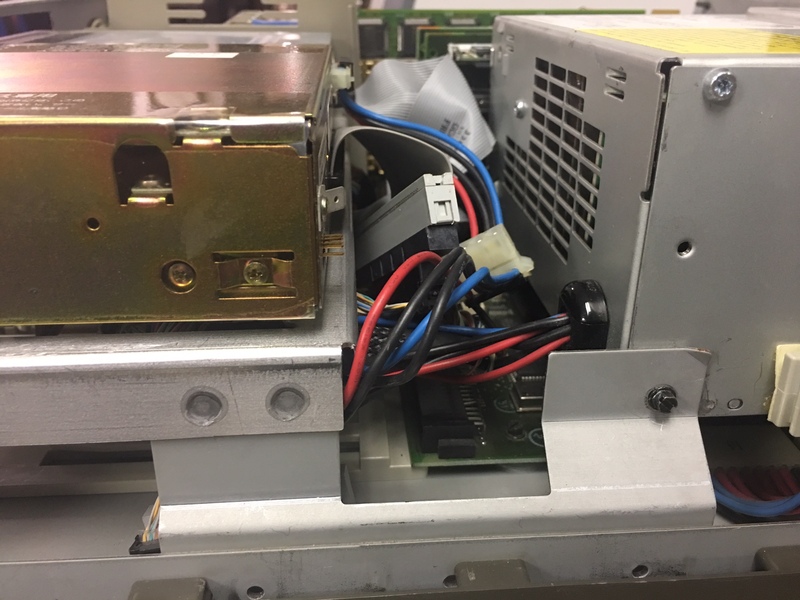 If you cheat and use the blue levers alone to seat it in a Model 95 without firmly seating the edge connector in the slot, you CAN shear off some surface mount components from the lower back side. Where the 95 edges out the 90 is drive bays and better work area. The 90 has a peculiar floppy cable, and when you add a ribbon SCSI cable, things tend to get jumbled between the corner of the drive support shelf and the PSU support bracket. Using a flexible sheathed cable like in the 957x series or the 95's F/W cables, it becomes much easier. I would like to see a round single floppy cable for the 90. That would really help eliminate the cable confusion.... Actually, the 95 could benefit from a round single floppy cable as well. I usually stuff the unneeded floppy connectors in the B: area. But that makes seating a full length card in Slot 3 a struggle. Mounting a CD ROM in a 90 depends on having the correct width drive sled and finding the uncommon CD Rom bezel. Whatever. If you think of it, a 90 is a fun box for the experienced user. A Model 90 is a system for a more experienced individual. Not that it is any more difficult than a 95 to configure, but you have to accept it has four slots and XGA on the planar. Thanks to UZnal, we now have True Color support for the XGA under Win9x AND protected mode support for the IBM SCSI adapters running on Pentium systems. Look at this ode to simplicity! The 50 pin flat cable is gone, making servicing the RAM risers _SO_ very much simpler. Do you see how the cable runs to the front, then under the adapters? 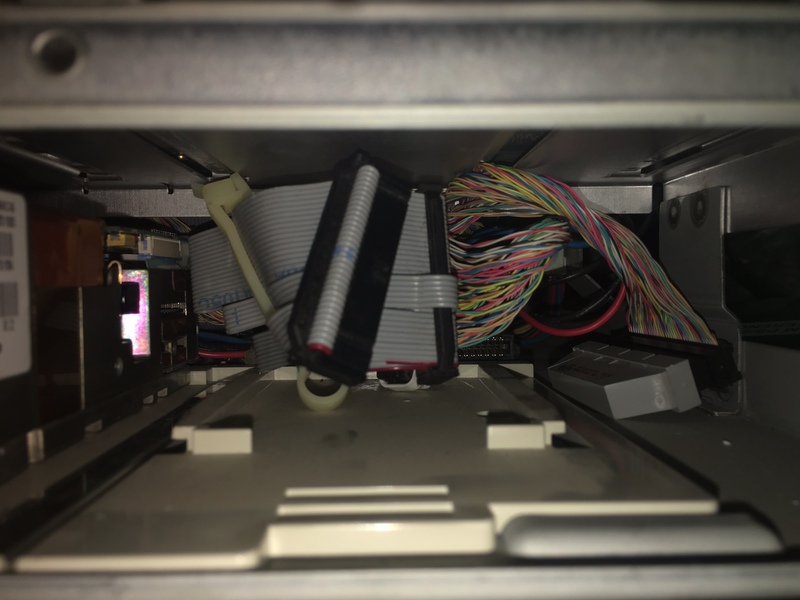 Using a SCSI cable that is long enough is crucial here, as short cables force one to place the SCSI card closer to the complex, and forcing you to run the cable over the complex or under the complex and barely reach the drives. Look at the cramped space available for hooking up the CDROM. What is difficult to see here is the thoughtful SCSI cabling. The F/W cable goes up to a 68 to 50 pin adapter. Now the space saver is the short length of 50 pin flat SCSI cable (white socket) running from the 68 to 50 pin adapter to end in the SCSI CDROM. The F/W cable then ends with an active terminator. Trying to insert a 68 to 50 pin adapter in the CDROM, then plug in a F/W HPDB68 plug into that crams the SCSI cable up against the front of the PSU. The new keyboard/mouse controller used on Model 90 and Model 95 XP 486 systems provide additional functions for mouse support. These include the ability to separately receive and send data to the keyboard and mouse ports simultaneously. This is not possible on previous PS/2 systems as only one I/O port is used for both keyboard and mouse data. NOTE: Current Loop interface is not supported on either serial port. Dual DMA serial ports (Type 3 Serial Controller), one DB25 and one DB9. The DB9 port requires feature number 0217 or 0242 for attaching devices with 25-pin D shell connectors. The DMA serial port supports 300 bps to 345.6K bps. DMA reduces CPU loading and overhead when used in higher speed communications. Speeds up to 345.6K bits per second are supported using IBM Enhanced EIA-232-D which requires a special shielded cable up to 20 feet long. Ether serial port can be set to Serial 1-8, with different arbitration levels for Transmit or Receive. Both ports are limited to Int 3 (Serial Controller chapter of HITR says Type 3 Serial Controllers can use Int3 or Int4. YMMV). With most Micro$oft products, enabling "Arbitration Level" results in problems, since IBM developed the DMA parallel port prior to industry standards being developed. You may have to disable Arbitration Level if your parallel port device fails to work. NOTE: The Parallel_1 dual I/O address range of (03BC-03BF 1278-127F int 7) has the Bi-Di compatible port at 03BC-03BF, while enabling dedicated or shared DMA operations enables DMA operations at 1278-127F (Model 90 SSI says 1278-127D... YMMV). The split was due to the old [and obsolete] MDA and Printer adapter I/O range. NOTE: IBM defines Parallel_2 as 0378-037F int 7, while everybody else calls it LPT1... So if you use a M$ product, and your printer won't print, check to see if both refer to the same I/O range. 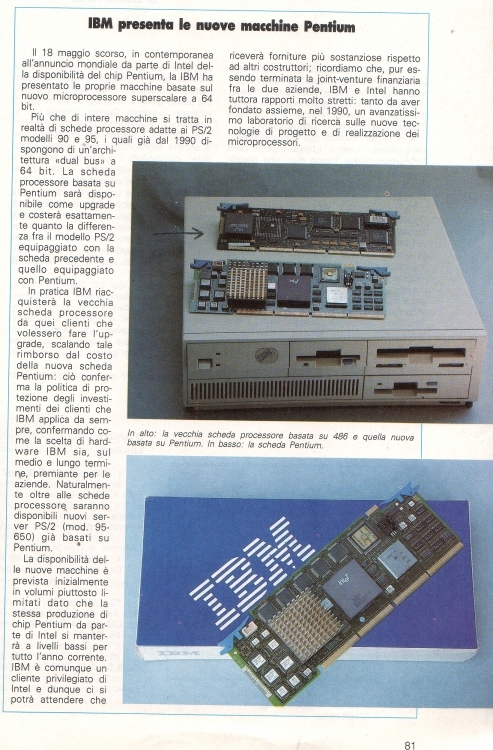 IBM only supported Int 7 on any PS/2 planar parallel port. Use any listed arbitration level. Shared means other devices can use same level, Dedicated means only this device can use that level. <Disabled> sets port in compatibility mode. NOTE: It may be possible to use Parallel_2 [LPT1 clone-wise] to enable DMA support. The Parallel_2 I/O range is mostly identical to the clone LPT1 I/O range. 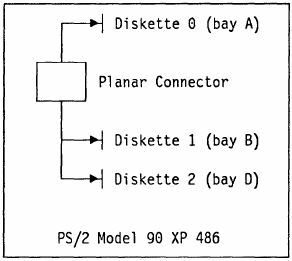 Vertical mounting of the PS/2 Model 9590 requires an appropriate fixture. The Model 90 left side vents point downward, with a minimum of one inch (25.4mm) between the vents and the supporting fixture. J16 and J23 Artifact- IBM brought out a "low-end" Mod. 90 with DBA-ESDI and a 386DX-20 processor board. (Ed. A big insurance company (Aetna?) had 386DX-20 complexes made for it- the "Type 0"). W98SE has 640x480x64k at 60Hz support. This requires 8 Video ZIPPs to be installed. VRAM chips are Toshiba TC524256BZ-10 or NEC D42274V-10. Model 90 systems have 8 sockets or 4 sockets / 4 soldered VRAM. NOTE: Any reference that says the 9590 has XGA-2 on the planar IS WRONG!!! 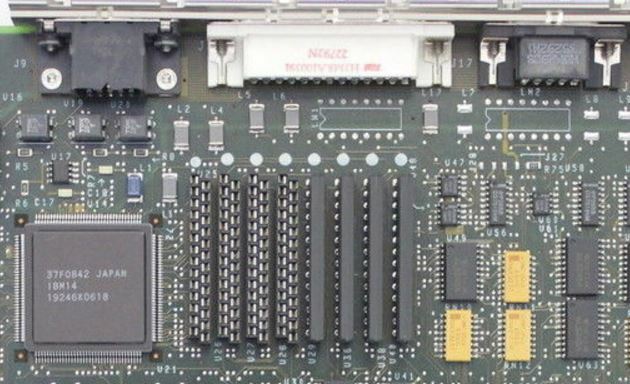 It has 512K soldered on the planar, plus 4 sockets for the 512K video memory upgrade. 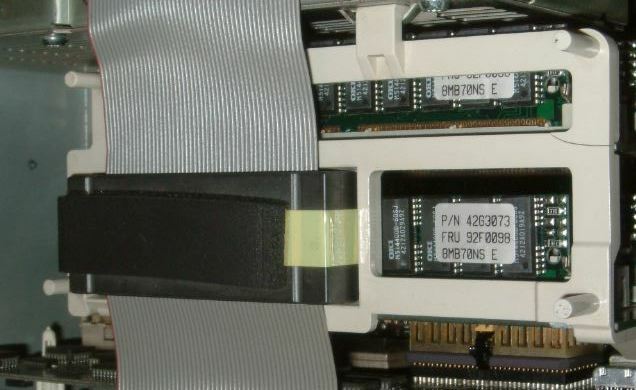 To make the 9590 ISO compliant they had to install XGA-2 cards in them. Ed. It is possible (Loch Ness Monster or Big Foot likely...) that IBM did do a few XGA-2 Model 90 planars. Never seen or heard of one. BUT... I have seen a picture of a P75 with an active matrix LCD screen instead of a plasma display. So _MAYBE_ the IBM Canada site referred to a short lived variant... YMMD. Note the white dots towards the rear of the planar. Do not start one end before the other. You can slightly rock the chip side to side to install into a stiff socket, but be careful! Which Slot for the XGA-2? Note: The AVE at the rear of Slot 3 is disabled when XGA is in extended graphics mode. 9590s lack DBA-ESDI artifacts, have 512K VRAM soldered on planar, and is a pretty green. The 9590 planar shows up as an XP 90 system board under setup. The parallel port has DMA support, but no Expressprint and no Wake on Ring. I picked up some sweet Vantec clone single floppy cables on ebuy. The space that the normal 90 floppy cable, with it's three device cable, is seriously cramped, even without the PSU support strut.This is a way to remove one 34 pin header, alter the cable, then crimp on a 40 pin plug. The keys for both plugs are on the LEFT. Pin 1 [red wire] HAS to be on the LEFT side. Both plugs have the holes facing UP. I don't know what happens if you miswire or swap orientation of the plugs. But you are placing signals where they weren't designed to go. YMMV. From the red wire (pin 1), count up 9 wires and slit about 2" from the 40 pin plug. Count up another seven wires, then slit about 2" from the 40 pin plug. Pull wires 10-16 (the ones you slit), and twist them 180 degrees [sets this floppy to A:]. Align the lower 9 wires, the twisted 7 wires, and the remaining wires through the 40 pin plug. Crimp. Trim excess with X-Acto knife or similar. Done. 61X8724 is the same length from latch to rear of 64F4863 slide, but the sides are about .25" longer to the front. Fits great, the cut-outs in the EMC bezel are not really needed. The 76/77 drive slide, 71G5706 (71F3300 appears to be earlier version) will not fit in C: (too long, plus catch is about .1 too long), BUT... BUT... if you slide the 76/77 slide into the D: bay, you will notice the frame recess is longer AND there are two sets of recesses for the catch at the front. Fits fine. Now why did IBM do THAT? Two sets of drive retainer slots? Perhaps... the DBA-ESDI drive sled fits the C bay, and IBM wanted you to be able to use the 56/57/76/77 drives in D??? So... that little plastic tool hanging off the inner rear wall of the Model 90 is specifically for a DBA-ESDI drive. They would normally NOT be supplied with a SCSI based system. I seated a 71G5706. 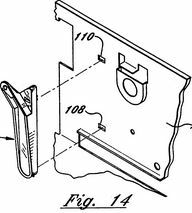 While the catch does not engage, it is a firm grip anyways, the EMC bezel is cut out at the corners AND has a cutout at the center where the longer catch fits snugly. 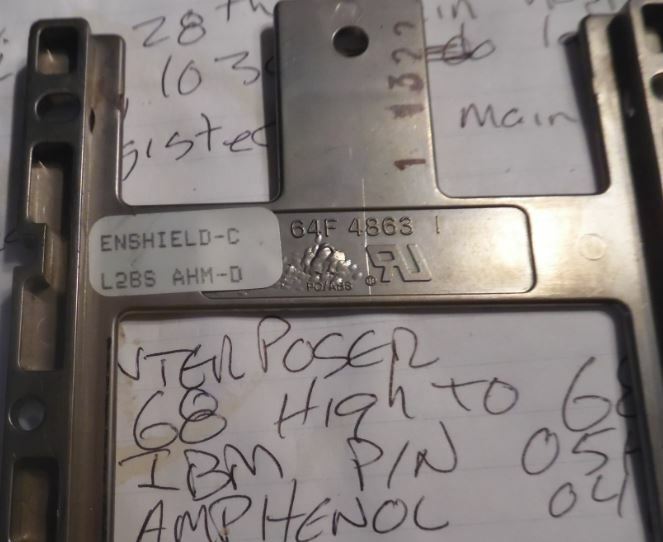 While digging for some AMP F/W connectors and Specta-Strip SCSI cable, I foundt another Model 90 hard drive sled, 64F4863. Again, another sticker saying "ENSHIELD-C". So I wendt looking and sha-zaam! "Electroplating is widely used for depositing a variety of metallic coatings onto plastic and metal substrates. Although most widely used for coating ABS or ABS blends many other plastics can now be coated. These include polypropylene, polysulfane, polyester, polycarbonate and other engineering resins. Electroplated coatings are unique in their ability to combine aesthetic appeal, wear and corrosion resistance with very high levels of shielding." Just because people said it isn't done, I threw three 1.44MB floppies into my 9590. All three showed up under setup as 1.44MB drives. Under DOS, they are accessable as A:, B:, and D:. Under W95, it blows the mind of the IOS driver and Win95 says you must shut the system down and restart Windoze. But under safe mode, I was able to access and read off the D: floppy. Older 8590s may have their floppy controllers FRIED if you use a 2.88MB floppy that has an asterisk ( * ) on the upper surface of the eject button. The 9590 is not affected by this charming quirk. There has to be an earlier floppy controller other than the 82077AA, which supports an asterisk marked floppy on my 9590. There also was a problem with local power-drops on the early Mod. 90 memory riser cards (the ones with all-plastic SIMM-sockets). Improved versions had metal holder clips. And - logically - you should not mix the two versions. There *must* be a plastic Support Bracket clipped over the 2 (two !) memory riser boards to properly fix them. This part is called "memory riser card support bracket" and is FRU 57F3029 [black] or 64F5752 [white]. It also has a "bay" to guide the SCSI-cable surface wave filter (that large heavy ferro-oxide block). Further Super High Intensity Tinkering with the Memory Riser Bracket show it does two basic functions first, retain the memory risers in the planar sockets, second, provide a space for the SCSI EMI filter. The retaining function covers keeping the risers down in the sockets via the bracket's fit against the underside of the cover. The other part is keeping the top of the risers from rocking back and forth between the complex and PSU. Memory must be loaded in matched pairs (size and speed) into sockets J1+J3 and J2+J4 for interleaved configurations. (Type 1, 3, and 4 complexes). Type 2 complexes allow you to stuff SIMMs in the sockets in any order or combination, but if not in matched pairs (J1+J3, J2+J4) there will be a performance hit. Don't stuff one riser with modules (especially double-sided) and leave the other blank. It *hates* imbalance on the memory drivers. Try to organize them the way to achieve a balanced load on *both* memory risers by having equal number of chips per pair, then on both risers. Certain releases of the Mod. 90 had problems with the double-sided SIMMs - especially with the 8MB .. [Ed.] Please genuflect while absorbing the riser/slot illustration. Remember, for interleaved configuration, you place matched speed/size SIMMs in A1-B1, A2-B2, and so on. Please note that the SIMM pairs do NOT cross between memory risers. The Model 95 uses separate A and B banks (A1, A2, A3, A4 then B1, B2, B3, B4) while the Model 90 uses both banks on both cards, A1, A2, B1, B2 then A3, A4, B3, B4). Unbalanced loading of memory SIMM's may cause parity errors in 8590's when using four or more memory SIMMs. A. Count total modules (chips) on both sides of SIMM. B. If 12 or less, the SIMM is LOW LOAD. C. If greater than 12, the SIMM is HIGH LOAD. If the SIMMs are either all HIGH LOAD, or all LOW LOAD, then install in both memory riser cards and exit this procedure. NOTE: For this procedure, memory will always be installed in matched pairs starting with J1&J3 then J2&J4 on memory riser cards. Riser card in J11 will always be fully populated first. 1. Install a low load matched pair in J2&J4 of memory riser in J11. 2. If only 4 SIMMs will be installed, go to step 3, if not, proceed with step 4. 3. Install two remaining matched SIMMs in J1&J3 of memory riser in J11 and exit. 5. For a LOW LOAD matched pair, install it in J1&J3 of memory riser in J11 and go to step 6. If remaining memory is HIGH LOAD then install a matched pair in J1&J3 of memory riser in J11. 6. Install remaining HIGH LOAD matched pair in J1&J3 of memory riser in J14 and exit. 7. Install a HIGH LOAD matched pair in J1&J3 of memory riser in J11. 8. If remaining memory is all HIGH or all LOW, install on memory riser in J14 and exit. 9. Install remaining LOW LOAD matched memory in J2&J4 and HIGH LOAD matched memory in J1&J3 of the memory riser in J14 and exit. This system has six SIMMs and it has been determined that the four 2MB SIMMs are LOW LOAD and the two 8MB SIMMs are HIGH LOAD. According to this procedure, no change is required. If memory riser card FRU P/N 33F4905 is populated with "MIXED SIMMs" and is experiencing any of the following errors: DOS NMI, OS/2 TRAP 0002, POST, or diagnostic memory errors, replace both memory riser cards with new FRU P/N 81F8823 (two required). NOTE: "MIXED SIMMs" is defined as SIMMs with 12 modules or more per SIMM, mixed with SIMMs having less than 12 modules per SIMM mounted on the same riser card. If FRU P/N 81F8823 is already installed, this ECA is not applicable. The "bad" riser (33F4905) has six electrolytic capacitors on the front. The "good" riser (81F8823 or 81F8827) has only the silk screen outlines for the caps (also a lot more SMD resistors and caps on the back). Both risers have metal clips and white SIMM sockets. Error code 201 says "Reseat system board memory" and can afflict the planar as well as the memory only. I would suggest to remove the memory risers, reseat all modules, plug them back and see if they are seated properly. I would also suggest that you start with one single pair of matching memory modules in the connectors J1 + J3 on riser J11 - the one closer to the processor board. This is just to test out if your problem is memory- or planar related. If the machine comes up fine (counts memory) - install the next pair in sockets J1 + J3 in Riser J14 - the on closer to the power supply to keep balanced load of the memory decoder lines. As I wrote: the Mod. 90 has a sensible feeling for imbalanced memory modules and may "spin out" with somewhat strange and unexplainable errors by no obvious reason. There once was a recommendation from IBM on that topic and they explicitly mentioned it for the Mod. 90 - particularly for those cases where double-sided memory modules are used (which put a higher load on the decoder lines). Memory adapters on the Micro Channel are NOT supported, although they may work. However, it is strongly recommended not to use them as they will significantly degrade the overall performance of the system, as memory on the Micro Channel is not cached. 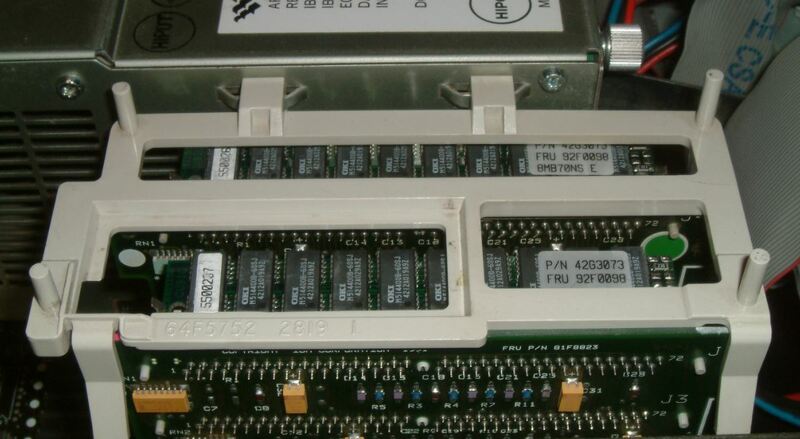 NOTE: Memory expansion adapters are only supported on 8590 special bid systems with 386 complexi (FRU P/N 33F8454) Known -402 are from WorldCom, Aetna, Royal Bank. Serial 1 - 8 or disabled. Must be enabled if using an ASCII terminal as a system console. Use any level. Shared with other devices. Dedicated, only this device can use that level. Parallel 1 through 3 or disabled. NOTE: Parallel 2 is the one Winblows calls LPT1! NOTE: LPT1 includes the I/O range 1278-127D to support DMA operations. DMA can be turned off via Arbitration Level if it is incompatible. Use any level. Shared, other devices can use same level. Dedicated, only this device can use that level. <Disabled> sets port in compatibility mode [known as bidirectional]. Complex CPU can preempt continuous data transfers by other devices for its use of MC. Address range for display controller registers, and location of video coprocessor registers. Memory address range used for system video ROM. 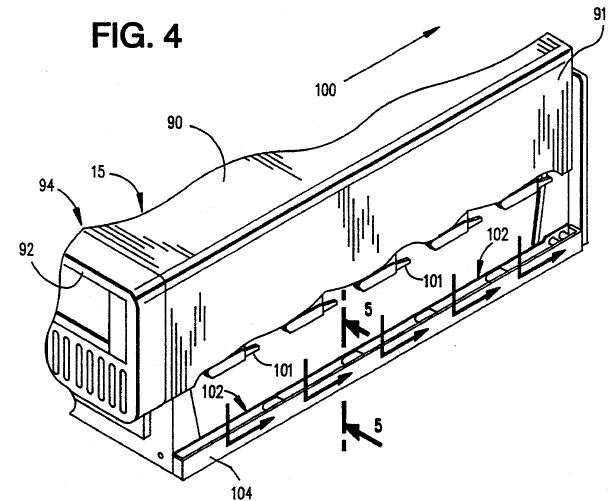 Whether video sub-system coprocessor follows fairness algorithm for bus usage.